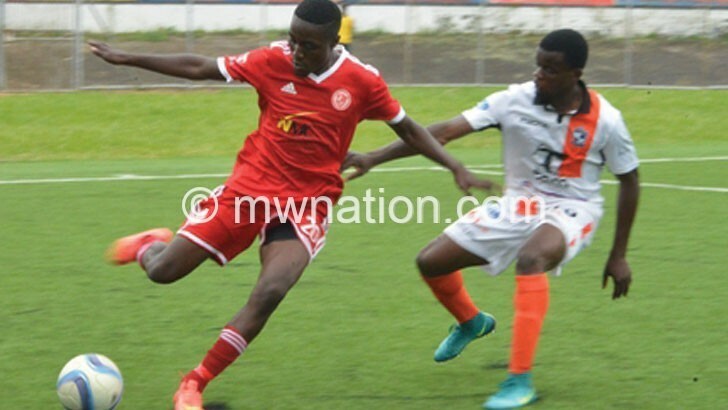 Be Forward Wanderers missed the Nyasa Top 4 Bonanza title through goal aggregate after tying on points with Mozambican side Ferroviario de Nampula yesterday. At the end of the bonanza, the Nomads and Nampula tied on five points as well as goal difference. But the Nampula-based outfit scored a goal more than Wanderers which made the difference, underlining the thin line that separates winners from losers in football. The Nomads needed to win their last game against their age-old domestic rivals Nyasa Big Bullets yesterday, but played out a one-all draw at Kamuzu Stadium in Blantyre. This was after Nampula and Zimbabwean Premier Soccer League side Chicken Inn also settled for a 1-1 draw in a curtain-raiser. Bullets have finished third with four points while Chicken Inn anchor the four-team tournament with a single point. In the Blantyre derby, the Nomads took the lead in the added time of the first half through their marksman Zicco Mkanda with a strike of utter beauty. He slotted the ball past advancing Bullets goalkeeper Ernest Kakhobwe in a one-on-one situation after being set up by Misheck Botomani, who had a leeway on the right flank as Wanderers counter-attacked. But despite the goal, it was Bullets who dominated the first half with four clear chances against Wanderers’ two. Bullets restored parity three minutes into the second half when Henry Kabichi controlled Precious Phiri’s diagonal pass before firing past Nomads’ ‘keeper William Thole. Nomads team manager Stevie Madeira said they missed their target of bagging seven points which could have seen them win the bonanza. “Nevertheless, it [the bonanza] has helped us identify our strengths and weaknesses. “In goalkeeping and defence we are good, our midfield is also okay, but we lack the fire-power upfront and will be our area of focus as we continue with preparations for the new season,” he said. On his part, Bullets’ Zimbabwean coach Callisto Pasuwa said he is worried with lack of fitness “and how we are [easily] conceding goals”. In yesterday’s other match, Chicken Inn drew first blood in the 50th minute through Obadiah Talumbwa before Rui Milambo restored parity in the 69th minute. Nampula coach Antero Cambaco said they have gained a lot from the bonanza as they prepare for the new season. “We had two different types of football. Malawi teams were very tactical in their approach while the Zimbabweans were more physical and good in aerial balls. “We have gained a lot from this competition and we thank Bullets for inviting us,” he said.